Where is the piano biz heading? In the wake of NAMM 2012 we see the lack of credible solutions to deal with the shrinking piano market. There are dealers with great sales programs – some of which succeed regionally or locally, but haven’t changed the national trend. There are publishers that partner with schools and manufacturers who have great method books – but increasingly out-of-date content. There are many players who are all for growth but either have no interest or ability to glance away from their core business even for a second, regardless of the cause. There are those who think promoting education is ridiculous and a waste of time – they’re moving boxes, and as long as enough boxes are moving, things are OK. There are some who’ve said it’s 30 years too late – and the only time to have done something effective was when times were good. There are the sales yahoos of the world who have tried to keep a pushy sales culture fostered alive and well – yet largely serve to perpetuate the idea that all we need to do is sell harder, better and bigger. There are so many seasoned pros spouting out the same thing year after year that it’s taken as truth, wisdom or fait accomplit. Meanwhile, the forces that support new piano players and market growth are among the most fragmented and poorly orchestrated programs out there. The shrinking piano market is not the problem to be solved – it is a merely a by-product of the shrinking population of new or active players. Trying to sell more pianos to a shrinking customer base is like trying to scalp more tickets when the game’s almost over. We’re emptying the water bottle at the beginning of our hike across the desert – hoping we’ll come across the oasis in time. Trade shows get us excited about new products. New products are the lifeblood of any industry, yet we can easily end up thinking that what worked yesterday to get new customers will work tomorrow. Yet, in a shrinking market all bets are off. If a new product fails to gain sufficient market despite newer better cheaper – what does it suggest? Circling the wagons around tradition is one response – but that sounds like a trip to the nursing home and a harbinger of the likely next destination from there. If any of this rings true, and there is any expectation of an ongoing market for pianos, then it’s time for a change. Change must come in the form of creating new players, which is the only vehicle to short term AND long term demand stimulus. 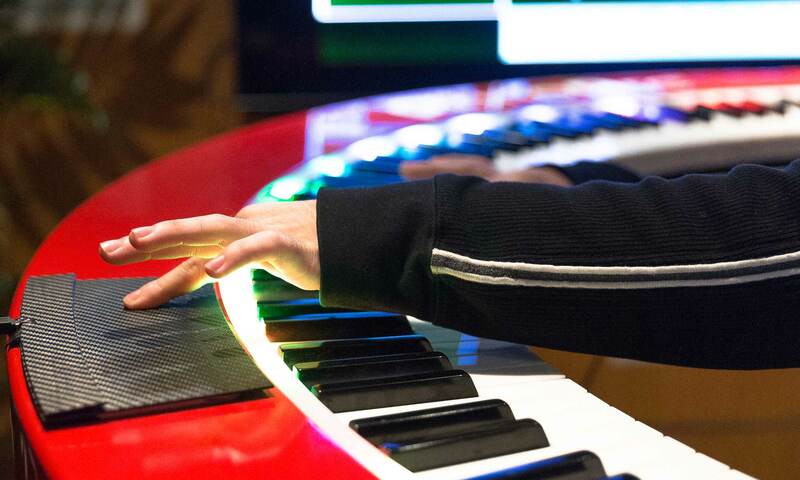 Consider the example of UPlayPiano, an approach we’ve helped evolve over the past year. The idea there is to harness web-based technology and after-school group participation to organize piano learning via the public schools. This is a private site being developed in conjunction with Daynes Music of Salt Lake City and the University of Utah. Social interaction, and interactive online tools create an environment where in school ideas can be easily brought home for exploration and allow students to progress at their own pace. Students and teachers rate and comment on the content delivering immediate critiques and ideas to the content creators and administrators for improvement. The program is in its infancy and in private beta stage, but it is one example of how change might come. We are building a framework where new instances of the technology can be created and customized for new private or public programs – with a hopeful goal of sharing content between programs. The best content would “bubble” to the top over time. Learn fast and share what we’ve learned to benefit all. It doesn’t have to be”My Way”. A single solution is unlikely given observed behavior in the piano industry and teaching community. The creative nature of the community suggests an endless loop of the song “My Way”. Alas, who is not guilty here? I’ve been so at times. Nonetheless it’s worth examining real pathways to BETTER solutions and to start flushing them out, and there’s no better time than now. We need to create self-sustaining programs outside a dealer or manufacturer’s marketing budget. The piano is worth it. The vast majority of those who’ve made the journey want to share the joy of expression it affords. Many of those who left it behind would also like to rediscover it as well. There is great potential out there. This is part venting, and part trying to figure out what needs to happen to keep the piano relevant. I also don’t want to broad brush things inappropriately – and I’d love to understand more of what’s already happening to change the direction. What do you think – and what do you know? Summing life up in one video.